Chatter File allows you to Upload, Share, Follow files in the cloud. 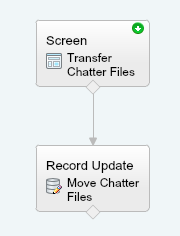 Chatter File helps the organization to discuss changes to the file in real time, from whatever device they are using. It also cuts down on email traffic and keeps all comments with the related documents for easy reference. You will get access to only those files that you own or have got access (because someone shared with you). There is no way to access someone (Other users) personal files (If it’s not shared with you) whether you are a System administrator or top of Role Hierarchy. This is one pain point for System administrator how to migrate Chatter files from one user to another user because sometimes business doesn’t want to lose all Chatter files owned by some user whom they are planning to derivative for some reason. Universal Container is using Salesforce Chatter File and wants to provide an easier way to their users so they can mass transfer file ownership with another user. I am back with a simple example to start with Visual Workflow. We will create an app using Flow to fire this flow will use Custom Link. Before proceeding you have to understand ContentDocument objects in Salesforce. It represents a document that has been uploaded to a library in Salesforce CRM Content or a file in Chatter. 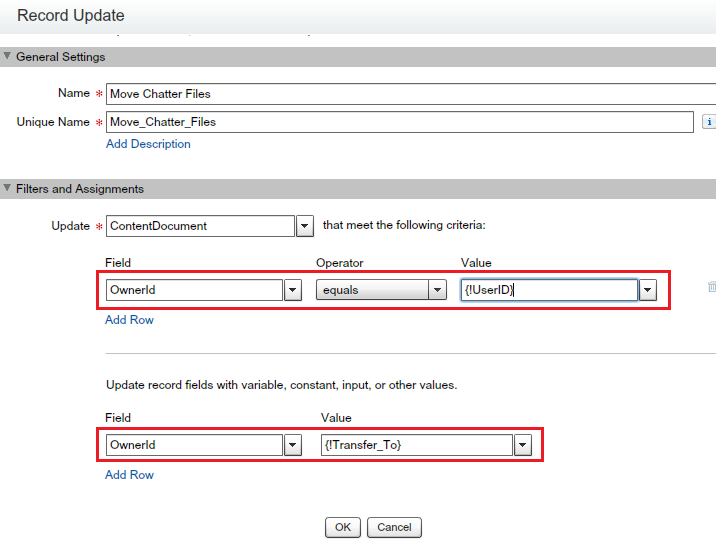 In this app, user have to enter a User ID in Transfer To field. In case if you want to enter Name and then wants to display corresponding users in this case you have to add one more screen and use Dynamic Choice. 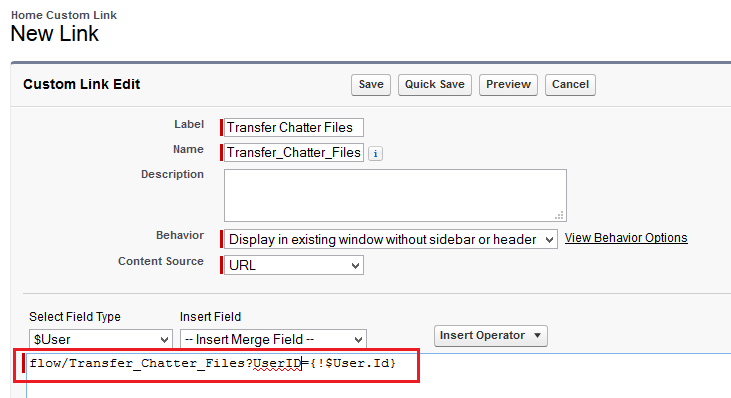 5) Save the flow with name Transfer Chatter Files and close the canvas. 1) In this demo I will be transferring Chatter Files from user “Demo User” to the user “Rakesh Gupta“, as a first step copy the ID of the user “Rakesh Gupta” and loggedIn as Demo User. You can add remove fields according to your business needs. I will suggest you to Implement this first on your developer org test it and then move it to Production. Let me know if you have any difficulty to Implement it. First of all thanks for this post , this is very much useful. I have a scenario wherein i want a File owner to be able to change the ownership of only one File is this doable through flow. Only for one file? Why not doing it manually? I would like to see if this is still validate and that there is no NEW COOL enhancements. I have a use case where I need to have a workflow set up to have all chatter files associated with a public chatter groups assigned to the group owners to delete where they see fit. As far as I know, there are no other way to achieve it. Awesome! I don’t suppose you’ve found a way to duplicate files instead of just moving them? I’m stumped on that one so far. Thanks Mark!. Yes you are right I never tried to find duplicate files but it’s a good idea. I will try it tomorrow, how you are trying to find duplicated files based on title or version ? Ooh now that I think about it, I was trying to duplicate Attachments, not Files. But if that didn’t work and I could duplicate Files, that would be a viable alternative. I’d be looking to duplicate all Attachments or Files associated with the source Opportunity. The Business Use Case is for opps where the salesman has procured a graphic during the sale that needs to go to the implementation team in another custom object once the opp is Closed Won.